Betsy DeVos testifies before the Senate Health, Education and Labor Committee confirmation hearing to be next Secretary of Education on Capitol Hill in Washington on Jan. 17. LEWISTON, Maine — It still isn’t clear whether U.S. Sen. Susan Collins is willing to vote for President Donald Trump’s nominee to run the Department of Education. Collins voted with other Republicans on a committee Tuesday to support sending Betsy DeVos’ name to the full Senate for consideration, but she specifically mentioned that she has yet to make up her mind which way to vote on the floor. Another Republican senator on the Senate Health, Education, Labor and Pensions Committee, Lisa Murkowski of Alaska, also expressed concern about DeVos, opening the door to the possibility the Senate will reject Trump’s choice. Maine’s other senator, independent Angus King, has already said he will vote against DeVos. Collins, one of 52 Republican senators, said she would vote for DeVos in committee because she believes in “considerable deference” to the president’s picks for Cabinet choices. She said every senator ought to have the right to vote. If the committee failed to back DeVos, the full Senate would never have the opportunity to weigh in. Collins said she knows DeVos “cares deeply about children” and has devoted considerable time and attention to helping children. But, Collins said, DeVos appears to view education through the lens of her experience pursuing alternatives to public education, such as charter schools and vouchers. It raises a question about whether she fully grasps the need “to strengthen our public schools,” said Maine’s senior senator. There are still questions about DeVos’ knowledge of federal education laws and programs as well, Collins said. “I was surprised and concerned” about her “apparent lack of familiarity” with the guarantee of a free and appropriate education for children with special needs since 1975, the senator said in the committee. Collins said she will continue to evaluate DeVos before casting a final vote on the Senate floor. Supporters argue that DeVos has spent her career fighting for better education for students who are often stuck in poor public schools. As the leader of the American Federation for Children, an organization whose mission is to improve K-12 education in ways that empower low-income parents, she won accolades from supporters as diverse as former first lady Barbara Bush and former Democratic vice presidential candidate Joe Lieberman. Critics say she is not qualified, too attached to private school alternatives and only under consideration because she’s been a big donor to the GOP for years. 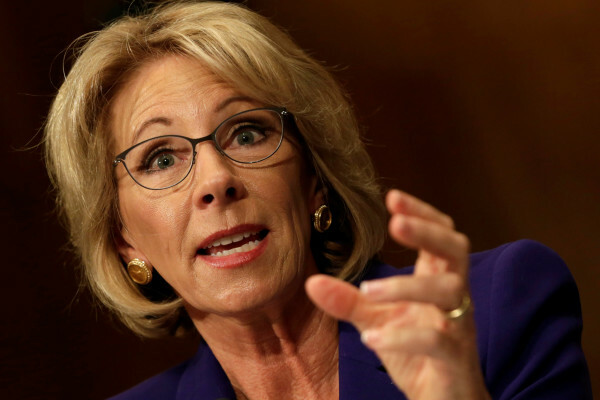 Democrats, who need at least three GOP votes to block any Cabinet nominee, are trying to stop some of Trump’s most highly visible nominees, including DeVos, who is strongly opposed by teachers’ unions and many public school officials around the country.